Reserve Bank of India (RBI) will shortly issue new banknotes of Rs. 10 denomination, the central bank said on 5th January 2018. The new Rs. 10 notes will be in the Mahatma Gandhi (New) Series, and will bear the signature of RBI Governor Dr Urjit R Patel, the central bank said in an official statement. The new denomination notes will have motif of the Sun Temple and the Konark on the reverse side, depicting the country's cultural heritage. The base colour of the notes is chocolate brown and they will have other designs, geometric patterns aligning with the overall colour scheme, both at the obverse and reverse, the RBI said. All the banknotes in the denomination of Rs. 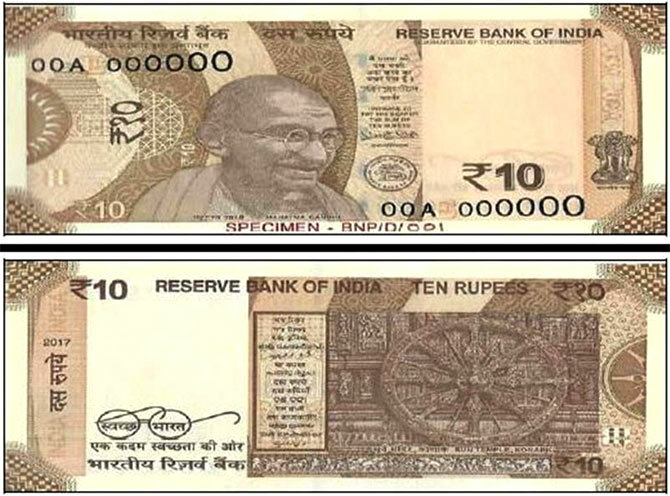 10 issued by the RBI in the earlier series will continue to be legal tender, it said.